Marble Works | The Best in Marble or Granite! 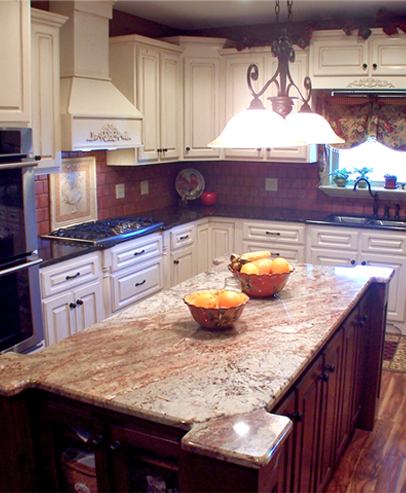 Marble Works is an expert in creating custom stone solutions for you and your home. Located in Henagar, Alabama, we serve northern Alabama and parts of Tennessee and Georgia. We work with our clients to provide floors, sinks, counters and many other surfaces. We are also experts in stone care and maintenance. Please use this website both as a catalog of products we offer and a resource for information about some of nature’s most beautiful creations — marble, granite and other stones. Is this your first time purchasing stone for your home? Be sure to read I Am Ready For Tops When… for information about the process of picking, customizing and installing your stone. Our Stone Care Guide and FAQ offer even more information about stone and how to keep your purchase protected from scratches, fading and other problems. Finally, when you’re ready to talk with someone about getting stone into your home, please contact us.